I’m not sure about you, but I have an ongoing list of thrift store and garage sale items that I am looking for. And last summer vintage hankies was on my list. garage sale. I felt sad that she didn’t want to keep her Mom’s hankies. I used them to make a curtain in our guest bath room. so I just tacked them lightly with a stitch here and there. My washer and dryer are also in this room. I am really enjoying seeing all the hankies displayed on the window. how pretty it looks with the vintage hankies. I think this is the first time I have showed any of our bathrooms. if so what are you doing with them? These are absolutely precious Dawn. LOVE them! Just beautiful Dawn- not just the hankies, but the way you’ve kept them all together too. I love Vintage hankies- and you’ve come upon some gems. Your bathroom is lovely, Dawn. The vintage hankies make a very pretty and delicate curtain -a perfect contrast with your rustic walls. 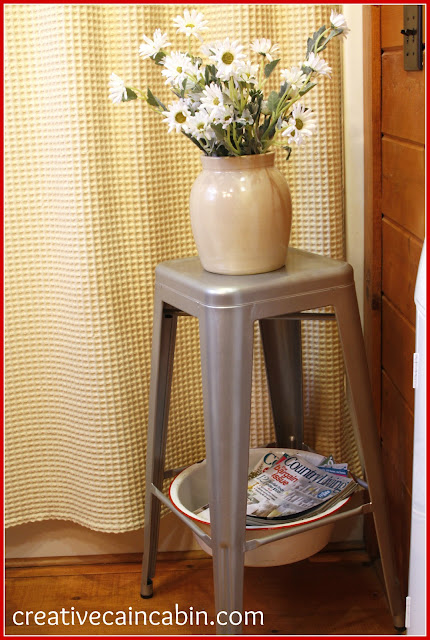 Love the stool and enamel basin too. My mom had tons of hankies with pretty crocheted edges in a rainbow of colours. Her bil brought them back from his many visits to his family in Poland. They were a thank you for scouring the thrift stores for specific items to send to his family. I don’t know what happened to them but I will ask my dad. Sooooooo cute and I love the stool idea with the enamelware pan holding mags. 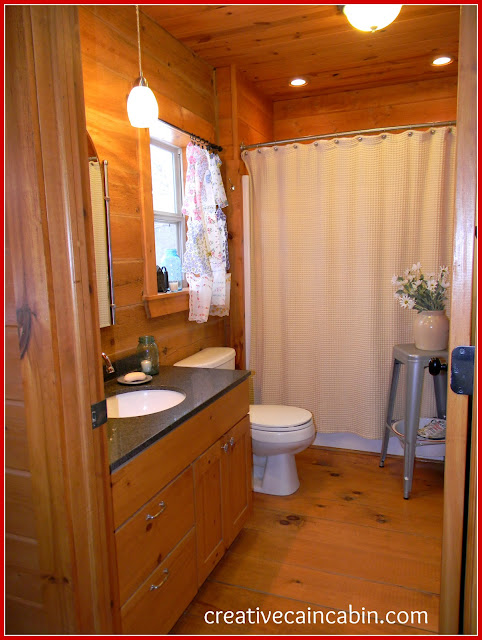 The hankies bring such pretty color into an already beautiful bathroom. I love all of the details in there, from the curtain to the stool and flowers to the wire box holding the towels. How cute!! I have a huge collection of vintage hankerchiefs and just love to collect them. I use them alot on pillows, banners, etc. I just can’t turn them down especially when they are not so costly. What a wonderful way to use vintage hankies! It looks so good! How sweet are those curtains. I love that idea. Your bathroom is so pretty. I love the old stool holding your magazines too. I love the way the colors of the hankies just pop in the bathroom. Very cute. I have a collection of vintage hankies….no plans yet 🙂 I just enjoy taking them out and looking at them, give them to my granddaughters to take with them to church when they come and visit…I show them how I fold them to make two babies in a cradle like my mother used to do for me (to keep me quiet in church)! How do you do that? What a sweet thing to pass along. I just love what you do with those hankies. Made the bathroom a little bit feminine. While I don’t have a collection, I have one that belonged to my great grandmother. Sadly, it has a bad (what appears to be) ink stain on it. I need to research the best method to try and remove it. Also have a few that belonged to my dad, which I cherish. 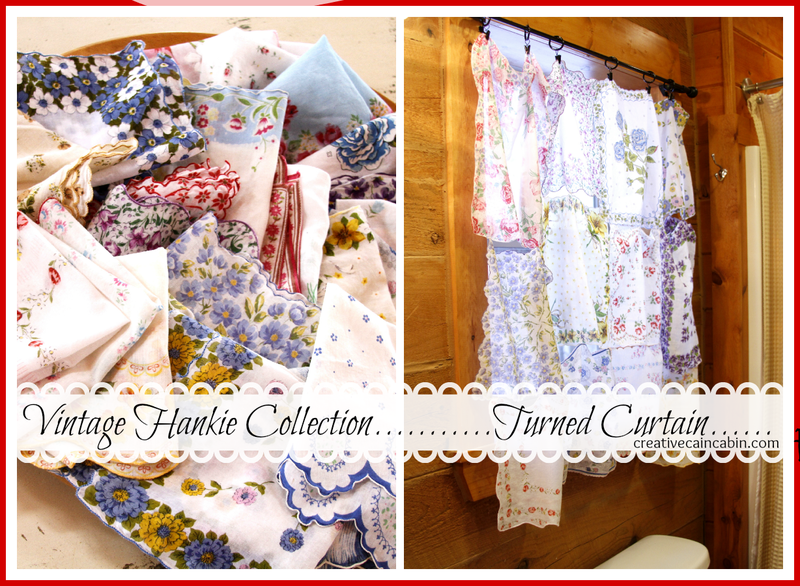 Your vintage hankie curtain looks so pretty, and is perfect at the window….but I thinks it’s so great that you bought the whole collection and kept it together. Every time you look at it,it will remind you of a lady who collected all the hankies…..so kind of you. These look so pretty! I been wanting to do something like this, or a cute valance. But I have been warned that they will fade from the sun, so I am leaning towards a valance with a white lace back valance. I think it really looks preety draped from how you tacked them. Love this space here. Now if I can just find some hankies!! So sad that she did not want to keep her mother’s hankies. I have one drawer full of hankies from an auction. I’ve been saving them to make something…someday. Yours are adorable as a curtain. Dawn, I saw this someplace else in Bloglandia and just adored the sweet, shabby, vintage look of it. Your’s turned out so charming! I love it against the rustic-ness of the pine planked walls! Beautiful job! 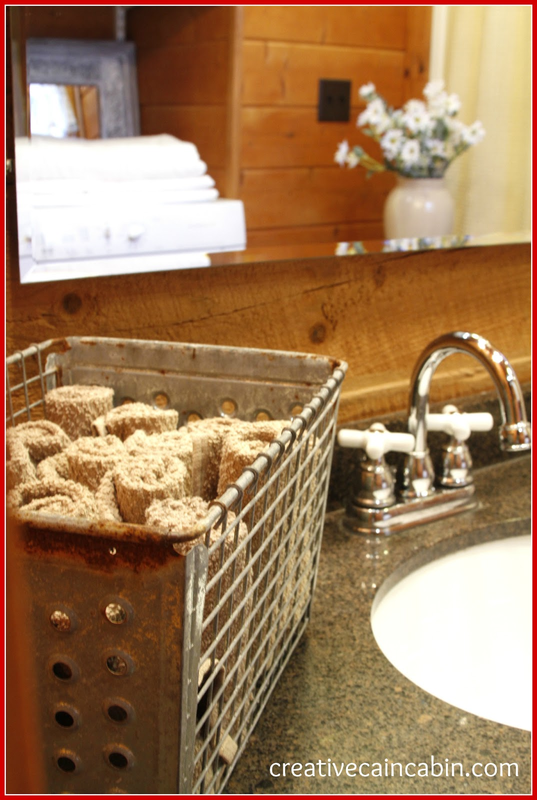 Love all the other pretty vintage things in your bathroom, too! Love how you used the hankies. They are darling as curtains. I have some old hankies and have used them as doilies on some of my shelves. You have such a glorious collection. Maybe that daughter will be sorry for getting rid of her Mom’s hankies some day. Maybe you could take a picture of your window to show her what you did with some of them, take it to her. I have several vintage hankies, some of which came from my Mother. I wouldn’t ever get rid of them. Have kept them safe for years and many moves. I’ve thought of framing them, did make a couple pillow covers using them. I like your idea best. I’ve been trying to find another light curtain idea for our master bath window and you have inspired me. Now I need to find them all to see how I can arrange them. I love the idea of the colors in our window. Will be so pretty. So glad you shared your curtain. 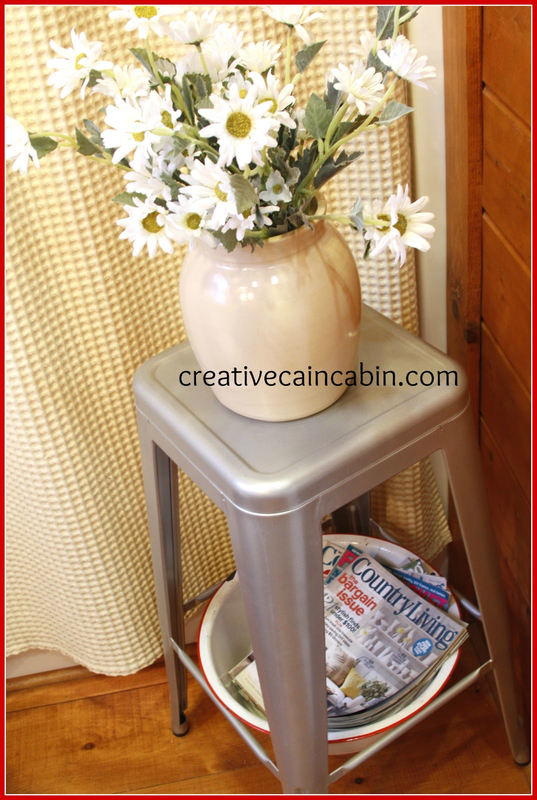 I was just over at Homespun Happenings looking at your kitchen. I am in love with those green stools. I love the linens in the great basket. I have the red and white tablecloth just like yours. How I love your new bathroom touches. 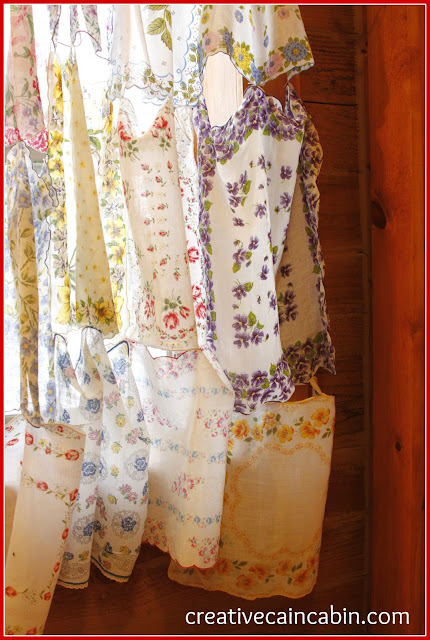 Your handkerchief window dressing is so sweet and it lets in so much soft light. You have done such a wonderful job with everything, my friend. The hankies are so sweet, Dawn. I have two hankies that had belonged to my Great Grandmother. They are treasures. I wish I had a collection. I just adore that you were so thoughtful to keep her hankies together and to tack them together and preserve them. How wonderful that they are being used and admired. They look so sweet on the window! All the bathroom looks fantastic, I like your basket too. I’ve never found any vintage hankies as pretty as yours. A few years ago a found a whole stack of new (vintage) ones at our salvation army, and I too made them into curtains for our laundry room! Yours are lovely! I love everything that you do Dawn. I think it’s safe to say I’m obsessed with your blog. Don’t worry though, I’m a harmless stalker. LOL! Love the hankies! So colorful and fun. Also love the touches of vintage throughout the bathroom. 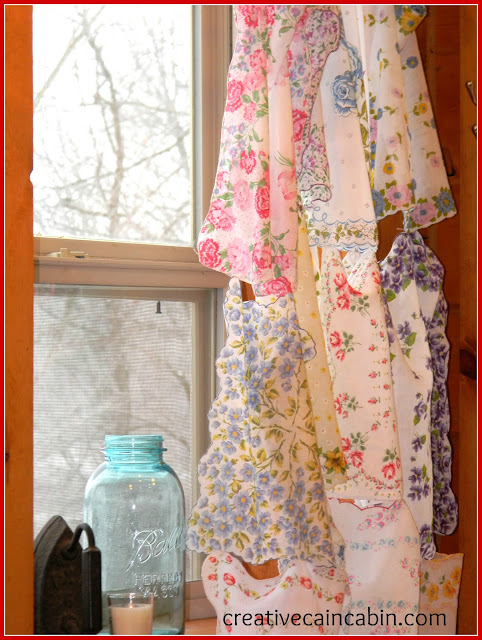 What a darling way to use a hankie collection! The curtain looks perfect in your bathroom. I’m visiting from On Sutton Place today… what a lovely blog you have and a beautiful home! The curtain is so pretty! One cannot save everything. And so things are sold or given away. And someone else gets the object(s) and can appreciate and love it. Where is the sadness in that? These curtains are lovely. Perfect. And maybe they will fade away. And that’s okay too. Nothing made by the hands of human last forever. Very little survives. The old hankies I have, I use to blow my nose with; that is their intended purpose! Curtain is beautiful! 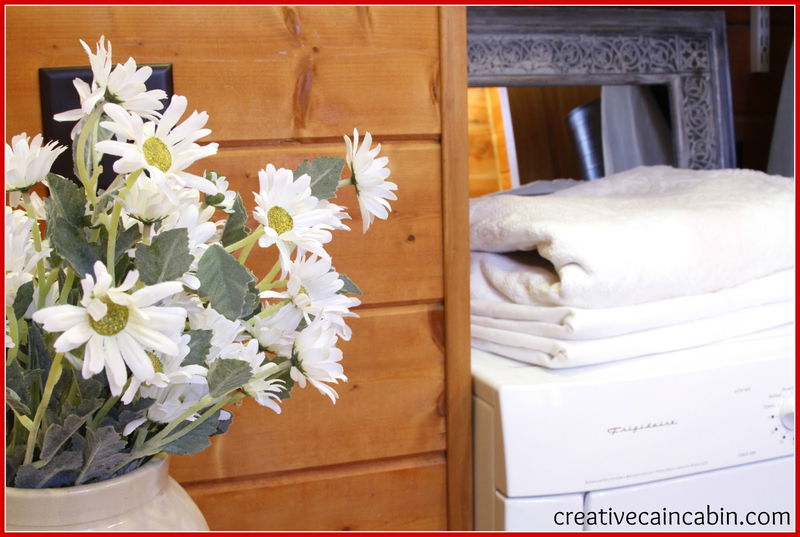 Do you have a window shade too to prevent people outside from looking in between the hankies? I live in a pickup camper so I could not keep my Moms hankies or aprons when she died and I have never seen them at rummage or estate sales. How special to have all the pretty colors too. The one thing I kept was the linen roller towels that I had to iron all the time. Beth, I live in the stix without a house in site there is no chance of anyone looking in the windows. LOL Our bathrooms are high enough that you couldn’t see in anyway. Hankies are at sales all the time here but aprons are harder to find. I just came across your blog, and I love your Hankie Curtain idea. I have a large stash of my Mother’s hankies. I don’t have a window to use, and I would be a bit worried about fading over time. But, you have given me another idea! I think I’ll made a shower curtain with them! I will sew them together to create the “fabric” for the curtain with a plastic shower curtain liner to protect them. I love all your cleaver ideas! Thanks!